Well said, but there is one major point that was left out. Marketing and advertising. If us old folk will think back it was the ads for D&D that also sparked the imagination and desire to get into the hobby. So while I totally agree with Erik I would have to also say public mass media marketing would not hurt either. Believe it or not I know a few tricks of the trade after 20 plus years that would either reduce or nullify the cost to the game advertiser. I am currently putting together a marketing plan that could help the community & its game creators. Erik I will give you the exclusive when everything is ready if that is OK with you. My idea like all of my others sounds crazy on the surface, but there is motive to my madness. This KS presentation feels like the old Hamlet quote, "The lady doth protest too much, methinks." Spot on, Erik. This is exactly what I was thinking. First, well said. Yes, we at Legendary Realms will have you and welcome a public Swords & Wizardry game at the store. We are friendly with everyone at Frog God, through the terrain side, and can probably work with them to put together a forward facing display of product. I will reach out to you via email and you can just let me know whenever you are ready. I don't think it would matter if S&W were on shelves, because the whole 3rd printing project rests on a mountain of unacknowledged and unexamined assumptions that are dubious at best, not the least of which is the notion that the 2nd printing does not have a significant female following due to the art direction. The in-store play idea is a better one. But I'm skeptical there too. I was part of a public meet-up group that ran many old school games in stores over the course of 2 to 3 years. The sessions were posted in advance on the internet, anyone could sign up, and folks who wanted to join in at the store without signing up in advance were welcomed. The games were pick-up and run by multiple DMs, so you didn't have to be a regular attendee to participate. As gamers go, the crowd these games drew was sociable, friendly, and inclusive. But very few women ever showed up to these events. Hey Erik, I'm Mike...I'm one of the owners of Legendary Realms. We'll glady have you twice a month. Just drop me a line on our Meetup and I'll take care of it. Some interesting points about the OSR that you addressed here: when we first opened the store 3.5 years ago, we pushed the OSR hard. S&W Complete was our best selling RPG book for a while. We regulalry sold out of LotFP, X-Plorers, and whatever other stuff we could get our hands on. I ran some successful sessions of the old Marvel FASERIP game and Warriors of the Red Planet. The problem soon became actually stocking that stuff over and over - aside from Lamentations, a lot of OSR stuff isn't easy to come by. Helping us push the OSR at that time, I think, was the fact that D&D was totally dead. Pretty much every customer hated 4E and we couldn't give the books away. As in literally - we tried to just give them to people and they refused to take them. Anyway, you're right - a lot of kids just want to play games, and when they see people having fun they want in. I'm glad that Tim has decided to run B&B in our store...I've played a few sessions and it's been a blast. On Halloween weekend Tim's going to run Tomb of Horrors all weekend to see if anyone can survive. If anyone wants to come down, feel free. There might even be prizes. Well said. It definitely takes more than a Kickstarter campaign and a reskinned book. I think it is a good first step that relies on presentation but it is going to be up to a lot of those that enjoy the OSR-style games to bring others into the hobby and genre. Playing in public is one great way to do that. Running pickup games at your local games & hobby store is another (both of which you mentioned). Ultimately, if the hobby is to expand it relies on a grass roots movement to bring others into it and spread the word about the enjoyment and fun it brings. "The play is the key." Boom. Mic drop. Spot on. Last nite was a blast. Hats off to Mike and everyone at Legendary Realms. I just love it there. Looking forward to Halloween weekend (henceforth known as ToH weekend.) Also looking forward to S&W, Tenkar style! Legendary Realms has always been a friend of Adventures Dark and Deep. We've got a good relationship, and they're a great bunch of folks. Glad to see the store getting a prominent mention! Even in store events merely draw existing gamers. The real heroes bringing people in are teachers running D&D clubs in their schools. I cannot agree more with in store play. As a games manager at a game store I can tell you that a visible game is a growing game. I keep a well stocked shelf of OSR games and they do sell well for me. Keeping product on the shelf and games running is stores is vital to growing the OSR as well as the hobby as a whole. 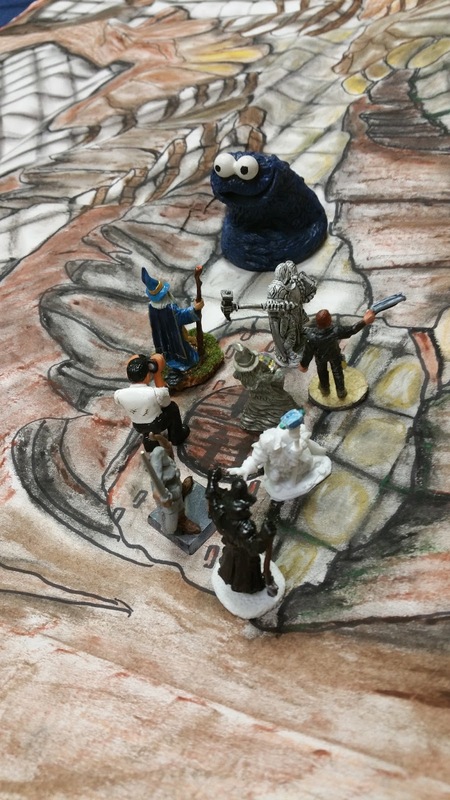 I run the weekly D&D Encounters but I have run some OSR games and they were well received by the players. DCC in particular has done very well. I hope the games go well for you and I am glad to see someone else willing to run games in a public space. I play out in the open at least once a year, in some crazy places/events you wouldn't imagine finding a table of D&D. When I did my 12 hour marathons at game stores, new and old alike would come. We had people show up that had found us on accident on the Internet and thought it sounded like fun. I don't know if they became fans of the *cough* "OSR" *cough* but I can tell you that they all enjoyed playing D&D. To me, that's good enough. I've found that public libraries will often bend over backwards to offer you a place to offer an open game in public and even do some of the promotion for you via their websites and print flyers / posters ... all for free. Have you tried Back to the Dungeon RPG yet? I sent you a link for a few copy from DrivThruRPG? In addition to playing in public, I would suggest bringing people in the old fashioned way: inviting them over for a night of gaming. I forgot to comment on this until I saw +Rick Stump mention it in a recent entry that in just saw today. *that I just saw today.